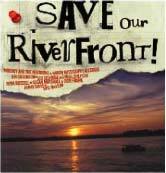 Check out our newly released Save Our Riverfront! CD. Read the rave reviews and get your own copy at ZebraRanch.com. Memphis musicians have given their time and talent to help save our riverfront. Now it's your turn. This CD is produced by Mary Lindsay Dickinson and features outstanding music by Cybill Shepherd, Jimmy Davis, Reba Russell, Mudboy and the Neutrons, Jim Dickinson, the North Mississippi Allstars, Susan Marshall, Sid Selvidge, Bob Frank and Hite McLean. All proceeds after expenses go to Friends for Our Riverfront.